We were out of cat food. Oh no! Yes, it was a somewhat dark day. We had come to the bottom of the Hills Ideal Balance bag and it was time to get more. I wasn't getting Hills, that's for sure. Not going to spend that kind of money on cat food no matter how much I love them. Besides, Merrick is just as good and it's cheaper for a bigger bag. I used to go to Pet Supplies Plus, back when we had a pride of cats in the house and everyone was eating Fancy Feast. It's across the street from my favorite Dunkin Donuts so it's close to me. Fancy Feast was always, always 5-10 cents cheaper than at the grocery or at Target. When you're buying 40 cans at a time, that's a big deal. But when I looked up places to buy Merrick, this store didn't come up on the list. Petco did and there is one in south Wheaton. Petco sponsors adoptions and their foundation is one of the biggest supporters of TNR; Trap, Neuter, Return; of feral cats. They work with Best Friends Animal Society and other no-kill organizations around the US to make the goal of "No More Homeless Pets" a reality. But prices tend to be higher at Petco and it's out of my way to go there. I have a Petco "loyalty" card, one of those little thingees that hang off a key ring. I hadn't seen any real benefit from it. I was also tired on Tuesday, yet the girls needed food. So, I drive to Petco. I am the ONLY customer in the store at 4:30 p.m. The store is located in a strip mall that has lost its major tenant, a Dominicks grocery store. The IHop closed, which is really sad because there isn't another one close to me. There is a cluster of stores to the north of the Dominicks and that's where the Petco is, but the parking lot looks so sad, so empty. The store manager greeted me as I came in and asked if I needed help. "I just need cat food." "That's over here," he replied. I resisted the urge to say, "I know." He's just trying to be helpful and I am the only customer in the store. He's probably thrilled to see someone. "Which brand?" he asked. "Merrick," I responded. I walked right to the display. Which Merrick to get them. We've had chicken flavor and they like that, but there is a salmon flavor and there is a version called "Healthy Weight". I stood weighing my options. The big bags were all priced the same. I opted for chicken since I knew they liked it. Franco took my bag to the front. The store manager, who hadn't left my side asked if I needed anything else. I got 3 cans of the Hills Ideal Balance wet cat food. Pilchard loves it and she's the chunkiest, at the moment. I have to travel for work in the next couple of weeks so my guilt at leaving them will be assuaged by a can of wet food which Mija will sniff and then look at me accusingly as if I'm trying to starve her. He asked, "Do you need litter?" I stopped. Actually, I do need litter. I have half of a box left and I have to replace, completely, the contents of one of the boxes. It's time to do that. Wash another box. Completely replace the litter and we're good to go. (One of the nice side effects of the change in food is no more stinky poopers. Seriously. If you're having problems with smelly poop, change the food. I get, maybe, one every other month. When I was feeding them Purina, "Oh lordy that smells" was an every other day occurrence, even with a clean litter box.) I looked at him. "Well, what does litter cost here? I'll buy a box if it's close to what I pay at the grocery." This is what we use and I watch for sales on this stuff. I know what price I'll pay and if it's that price or lower, I buy it, even if I have a box or two. It's going to get used. It was $2 more. That was close, but I was willing to wait to go to the grocery since I have to go anyway this weekend. I told him what I paid the last time I got litter and he said, "We can match that." Well, sold then. "Only one box?" 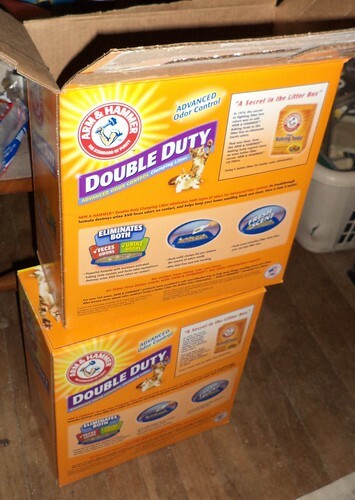 Yeah, even matching the price, I didn't need another box, even completely replacing litter. I'm good. I have to consider that I have to lug it into the house. The manager grabbed the litter and took that up front. Franco carried the litter and the food out to the Jeep for me, too. When I paid for everything, I discovered the food was $2 off because of my "loyalty" card. I saved $4 which more than covers the sales tax and the gas to drive out of my way. I still wonder if Pet Supplies carries Merrick. I should go there and see. I can't count on that store manager always being at Petco and matching the price for litter. I need to be aware of what things costs around me. But I was impressed. I guess I will be back.